Yamba Golf & Country Club has been nominated for 3 awards at the Qld Golf Industry Awards. For the second year running we are very pleased to announce that Yamba Golf & Country Club has WON the Regional Pro Am of the Year award. Words cannot express how proud we are of this accomplishment. 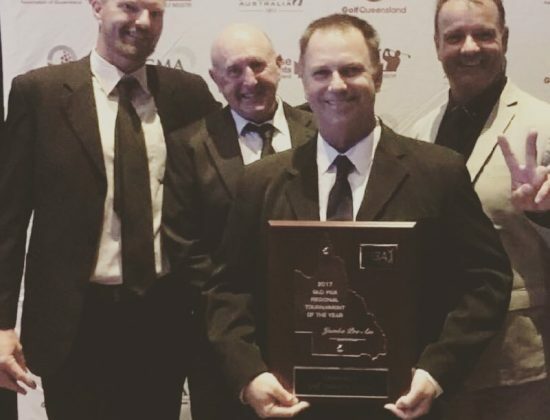 We are deeply honoured to be chosen as the winners against very tough competition, and this award is a testament to the many hard working people we have on our team, who strive to make Yamba Golf & Country Club the amazing Club that it is. Pictured above at the awards are our GM Luke Stephenson, President Tony Moran, Operations Manager Chris Durrington and PGA Professional John Wright. Thank you to our awesome team.